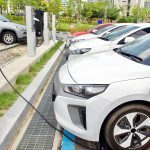 FleetCarma » EV Industry » EV Charging » Will Additional Public Charging Infrastructure Improve EV Adoption? On the surface, it seems like a strange question to ask; surely more charging infrastructure increases the chance for electric vehicles (EVs) to thrive. There appears to be a fascination of expanding the number of public charging stations that can charge at rapid rates as investment continues to pour into public infrastructure projects. The question this article asks is whether the public infrastructure is the best policy to encourage users to switch to electric vehicles (EVs). Policymakers continue to tackle with how to break down barriers, the most significant being the availability of charging. Governments around the world have initiated public infrastructure programs on a national and local level. Furthermore, introduced financial incentives for home-charging installation, however, such solutions only cover EV drivers with access to off-street parking. In the US, the public and private charging network have grown exponentially from 5,070 to 50,991 over a 6-year period from 2011 to 2017. The trend shows no sign of slowing as California, New York, and New Jersey have recently pledged $1.3 billion toward charging infrastructure in the coming years. However, does the current policy strategy reflect the needs of EV drivers? When and Where Do EV Drivers Charge? According to the U.S Department of Energy, 80% of EV owners charge at the convenience of their own home. Ideally, charging will occur when the vehicle is idle for longer than a four-hour period, in other words overnight. Overnight charging allows users to benefit from cheaper off-peak tariffs as the demand for electricity is low, and also take advantage of less carbon-intensive renewable power. As EV adoption increases, the extra strain on the electricity grid may become a concern. Bloomberg reports that global electricity consumption from EVs is expected to rise from just 6 TWh in 2016 to 1,800 TWh by 2040. An immediate reaction signals towards building out electricity infrastructure to cope with new demand. However, to help mitigate new electricity requirements, technology has emerged in demand-side management. In the US nationally, the peak demand of electricity occurs between 3-6pm (note this can vary significantly depending on location), which is when electricity tariffs are at their highest. Therefore, it provides EV drivers incentives to charge off-peak. Notably, energy suppliers are now offering cheaper tariffs specifically for drivers who choose to charge their EVs at night. Efforts to smooth out spikes in electricity demand will both increase efficiency and resilience. FleetCarma has been working with electric utilities to support peak electricity reduction by providing incentives to users for off-peak charging. The SmartCharge Rewards plug-and-play program helps utilities shift EV charging to off-peak hours, making loads much more manageable. Equally, it will assist EV owners to optimize charging habits, and reduce the overall costs of charging. Therefore, creating the best of both worlds for EV driver and utility. The majority of charging takes place at the convenience of user’s homes. Furthermore, incentives exist to encourage users to charge at night. However, the majority of charging solutions accommodate those with easy access to off-street parking. Charging if you live in a condo or apartment is much more complicated. Depending on your location, the requirements of charging infrastructure will change. For example, in Toronto, more residents live in apartments than they do in single-detached houses. Therefore, the bulk of residents do not have access to off-street parking, thus no immediate access to an electrical socket, which limits options significantly. In populated urban areas, building infrastructure appears to favor apartments, as seen in Canada with Vancouver, Montreal, and Toronto. Similarly, this is the case in other populated urban areas. The Union of Concerned Scientists surveyed in 2013, to find that 58 percent of the US could not use EVs because they do not meet the minimum requirements of having a parking space and access to a charging unit, and only 25 percent meet the criteria for battery EVs. Over the last few years, the significant focus has been on increasing the supply of public charging stations. However, this has neglected what drivers need. New demand-led infrastructure initiatives are beginning to emerge that look to address residential charging. The Curbside Electric Vehicle (EV) Pilot program in Vancouver supports the growth of EVs by increasing access to home and public charging. The scheme is specifically targeted at those that do not have access to off-street parking, such as a driveway or garage. However, applicants are responsible for the costs of the EV charger installation and maintenance. Plug-in British Columbia Residential Building Incentive provides government funding for the purchase and installation of one or multiple Level 2 charging stations in multi-unit residential buildings with three units or more. The incentive covers 75% of total project costs up to $4,000 per station. In California, Pacific Gas and Electric Company (PG&E) have launched its new EV Charge Network program. Partnering with business customers and EV charging companies, PG&E will install 7,500 EV chargers at condominiums, apartment buildings and workplaces across Northern and Central California, including at sites in disadvantaged communities. A recent white paper by The International Council of Clean Transportation recognizes the demand for a multifaceted and collaborative approach on a national and local level to building out charging infrastructure programs. In other words, as EV charging infrastructure is a crucial barrier to adoption, there is a need to take a more holistic view. Public infrastructure will remain important, but the key driver will be residential charging, and specifically on-street solutions. EV drivers want to charge at home. However, in urban areas the access to off-street charging is limited. Industry and policymakers have the challenge of providing greater access to charging in residential areas, which in turn may prove to be the catalyst in improving EV adoption levels.